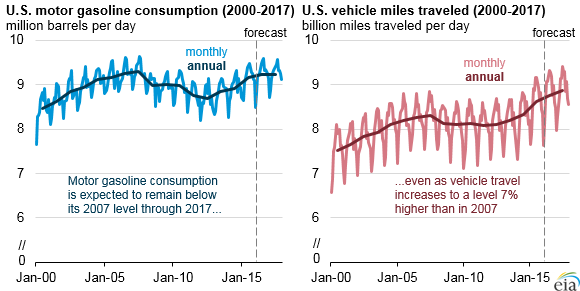 Based on estimates in the most recent Short-Term Energy Outlook (STEO), vehicle travel in the United States in 2015 was almost 4% above its 2007 level, but motor gasoline consumption has not exceeded its previous peak in 2007. Improvements in light-duty vehicle fuel economy are largely responsible for this outcome. STEO forecasts motor gasoline consumption to average 9.23 million barrels per day (b/d) in both 2016 and 2017, about 0.6% below its 2007 level. In contrast, vehicle travel is expected to grow to levels 5% and 7% above the 2007 level in 2016 and 2017, respectively. Lower gasoline prices and changes in the economy affect growth in vehicle travel. Projected growth in vehicle travel remains consistent with increases in macroeconomic indicators such as nonfarm employment and real disposable income. The combination of an increasing share of the baby-boomer generation reaching retirement and continued increases in vehicle fuel economy is expected to limit growth in motor gasoline consumption for the forecast interval and beyond.